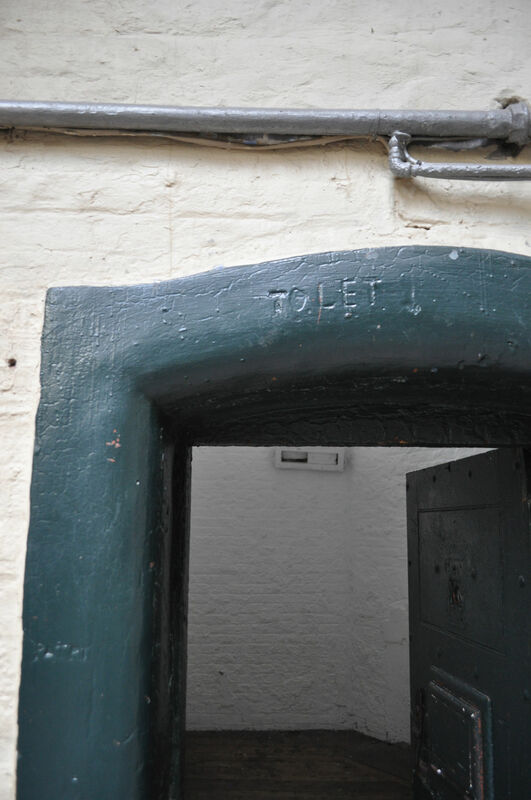 You are currently browsing the tag archive for the ‘Kilmainham Gaol’ tag. 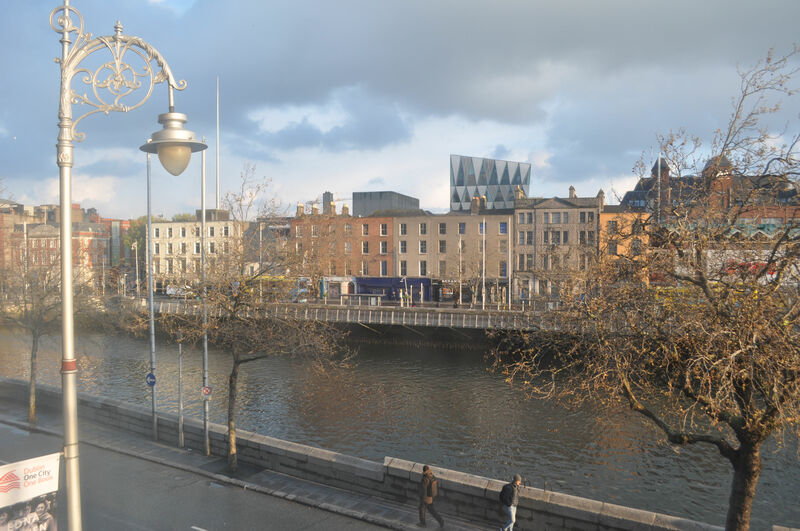 The view out the window of our AirBnb room on George’s Quay, in central Dublin, right on the River Liffey. Tara and I got up early and caught a city bus to the other side of downtown Dublin. On our second day Tara was feeling better so we could explore together, unlike yesterday. Our first brave thing on this trip had been taking the express bus from the airport and finding our way to the apartment without copping out and hiring a taxi. 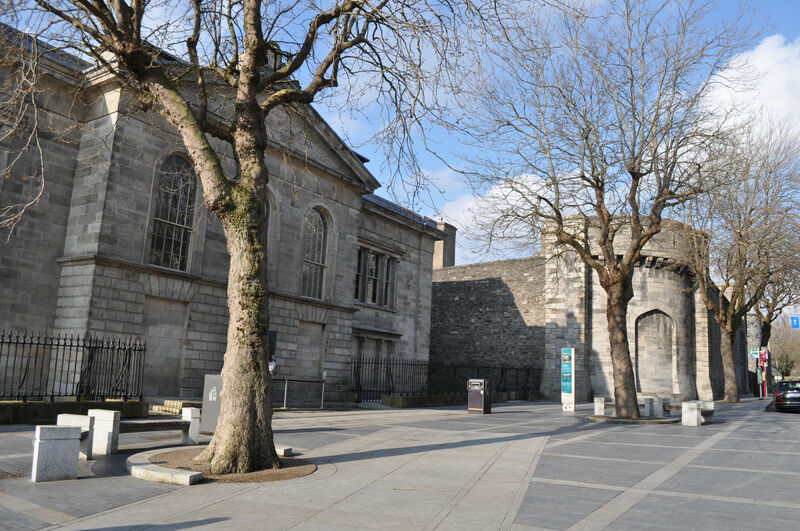 Our second brave thing was to take the city bus from the apartment to Kilmainham Gaol. We found out the bus we needed, and the stop, by using Google maps. But we didn’t know the fare. While we waited for our bus, we saw fares posted on the outside of a different bus, with a note to use exact change, which we didn’t have! So we hustled back to the main street, found a convenience store and asked for change for the bus, which the shopkeeper graciously complied with, no questions asked. Then we ran back to the bus stop just as our bus was arriving, and hopped on. We used the map on my phone to track our progress and hit the button to stop when we got close. As we thanked the driver, he pointed the direction we should walk for Kilmainham Gaol, and viola! We arrived on time, produced our tickets, and were ushered directly inside. 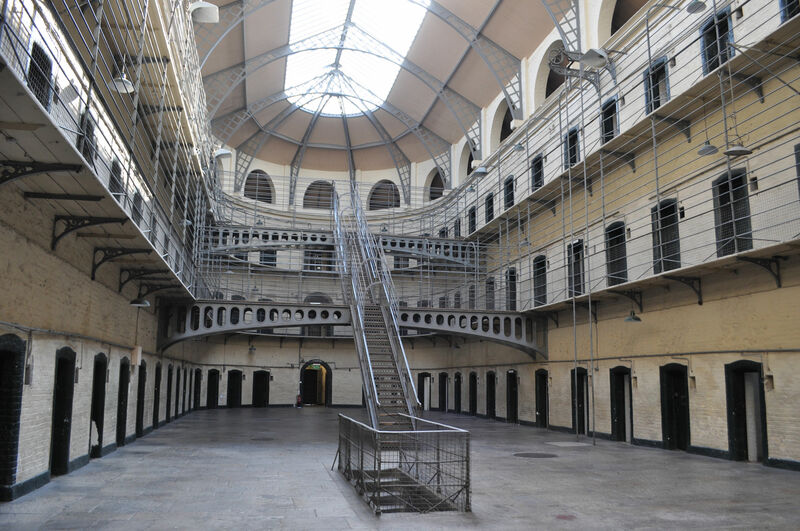 The Kilmainham Jail opened in 1796 and is important in Ireland for multiple reasons. 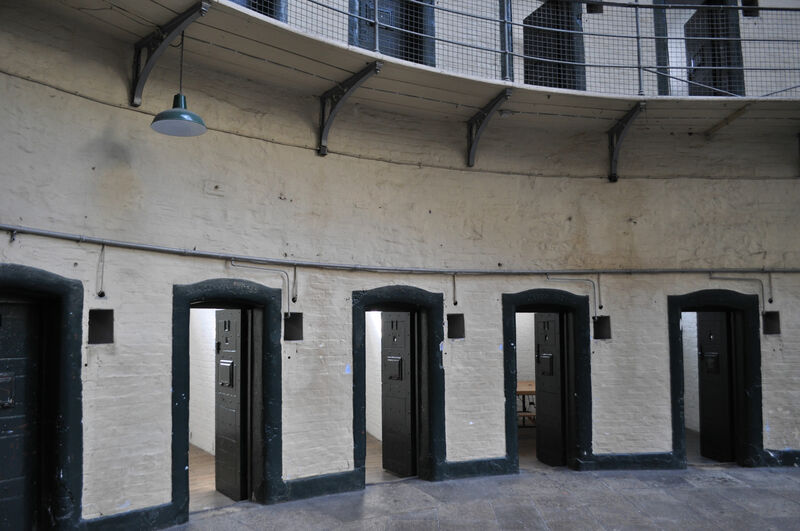 First of all, it was the first jail to offer individual cells, men separated from women and children, and with a design of cells surrounding a central open area. Our guide explained that this was following the Panopticon design idea from Bentham, in which cells were arranged to make inmates more visible to the jailers. 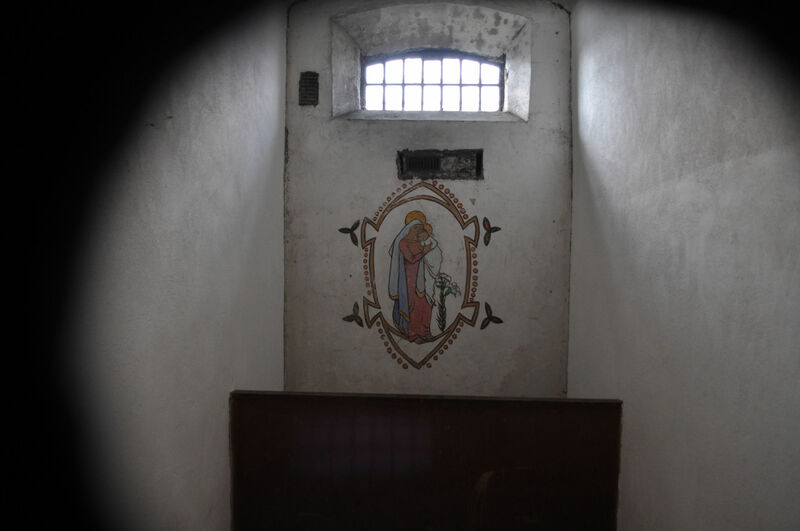 Artwork done by famous inmate Grace Gifford Plunkett. The open center of the jail – unlike any jail built before it. Looking into the cells ringing the center. Graffitti from inmate – likely on his last day there. 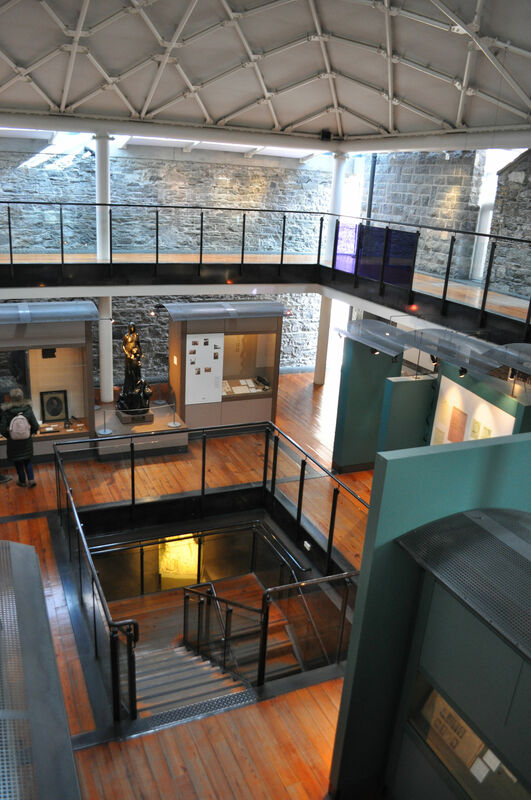 Kilmainham Gaol Museum is three stories high. 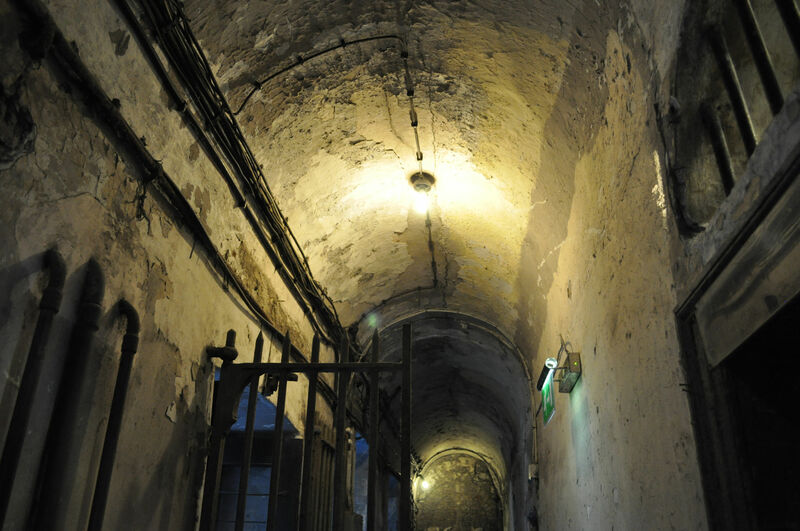 The jail is currently most famous for its association with imprisonment of political activists, and with the execution of 14 men following the Easter Uprising in 1916. 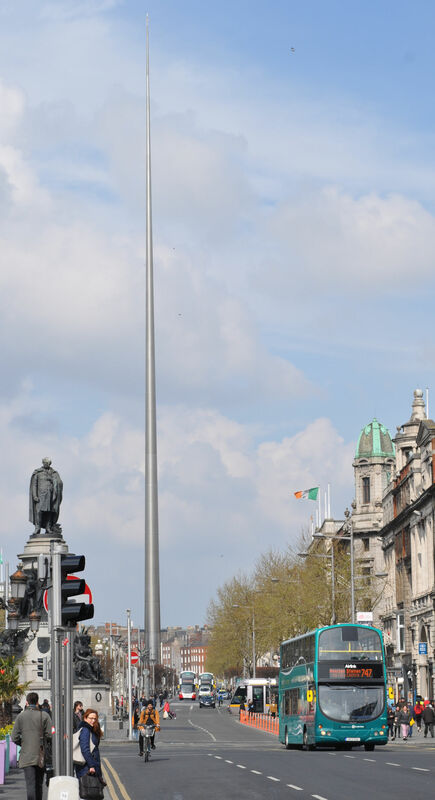 Prior to the trip I had been trying to educate myself on Irish political history and learned about the drastic turn of Irish public sentiment from predominantly neutral on the question of Irish independence, to predominantly in favor. This was because British Troops came in and rounded anyone up that was vaguely associated with the rebellion, or that they simply felt threatened by. They held courts-martial in secret and condemned 90 people to death. 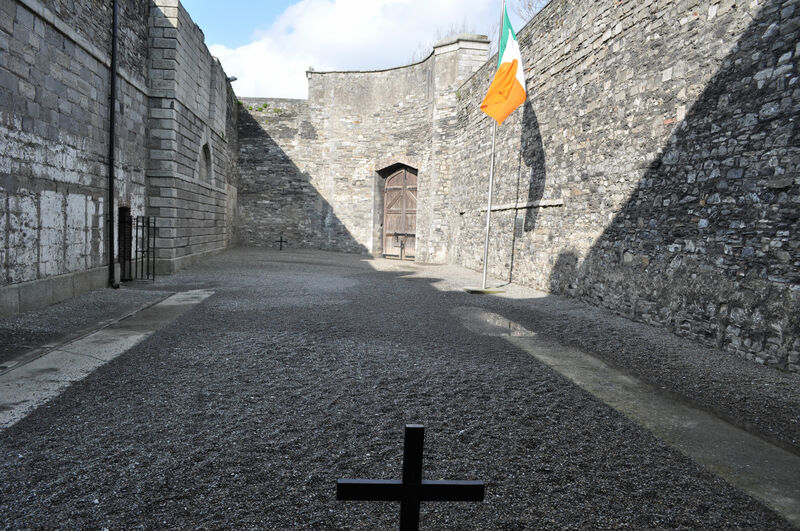 Then they began executing them, a few each day, in Kilmainham Jail. One of the Irish Republican leaders, James Connolly, was so injured and sick that he could not hold himself up, and had to be tied to a chair in order to be executed. The public became more agitated each day as they heard about the murders, and finally a stop was put to the executions because elections were coming up and this was not going to help current leaders get re-elected. Our tour guide said that in her opinion, the fallout from the Easter Uprising was the event that changed the tide of Irish history. And there we were, in the very place where it happened. 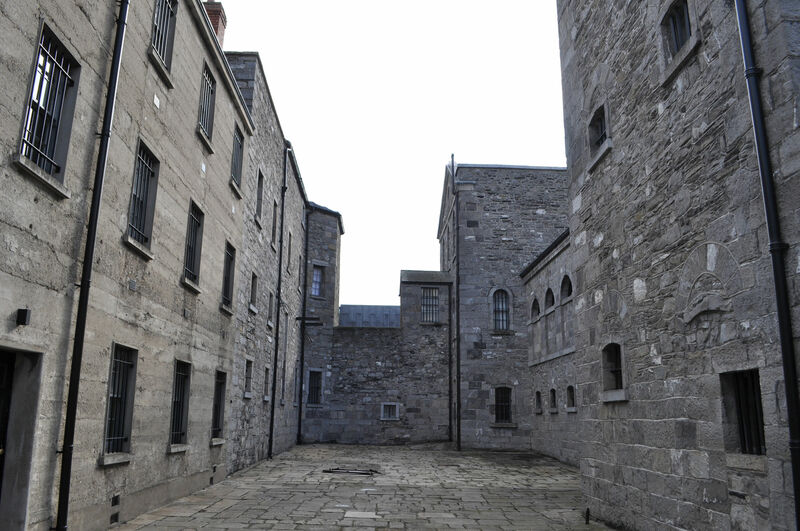 Courtyard within the jail complex. 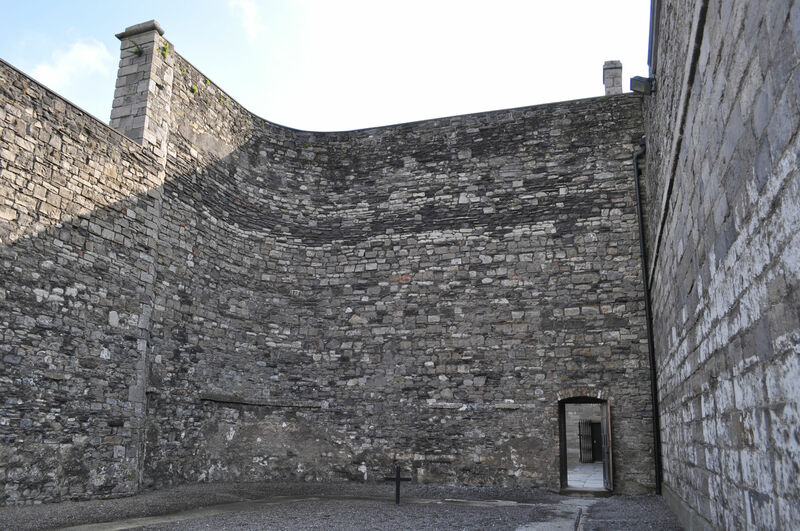 This is the wall at which 13 men were executed in May 1916. Except for the flag, this is what they saw before they died…if they were not blindfolded. Connolly, the 14th man, was executed down at that end, since it would have been too much trouble to drag him from that door (where he arrived in a stretcher from the hospital) all the way to this end. 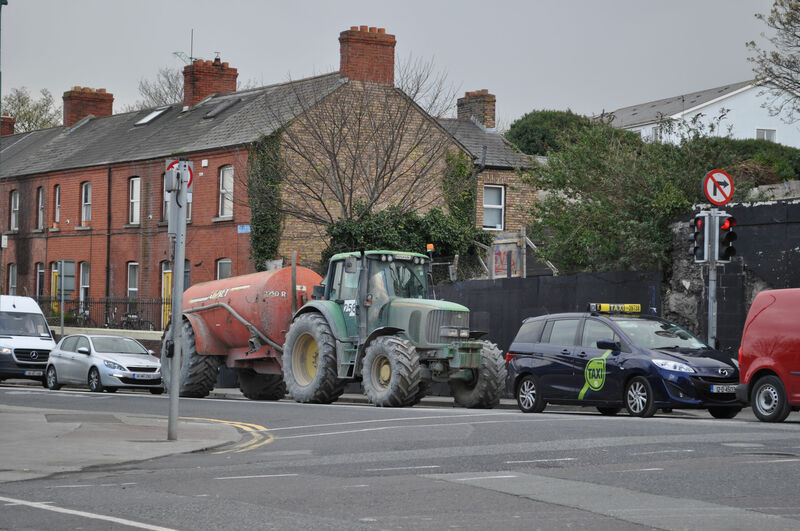 I found it amusing to have a farm truck on the streets of Dublin. 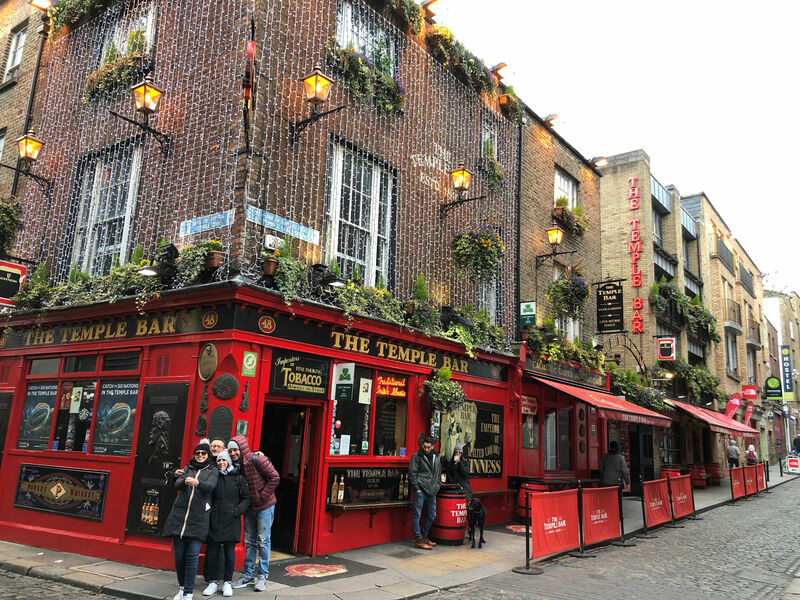 Temple Bar – don’t know why it’s famous, but lots of people were having their photos taken here. 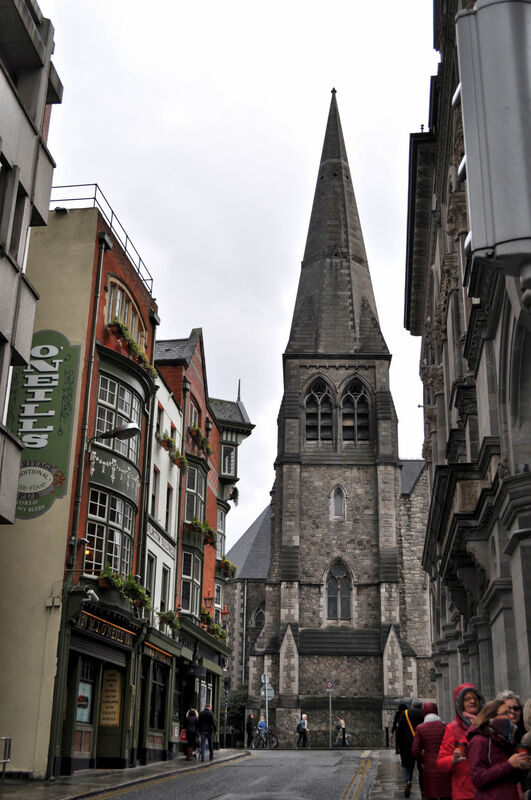 We wandered the streets in the Temple Bar area, since that is the area around our room. 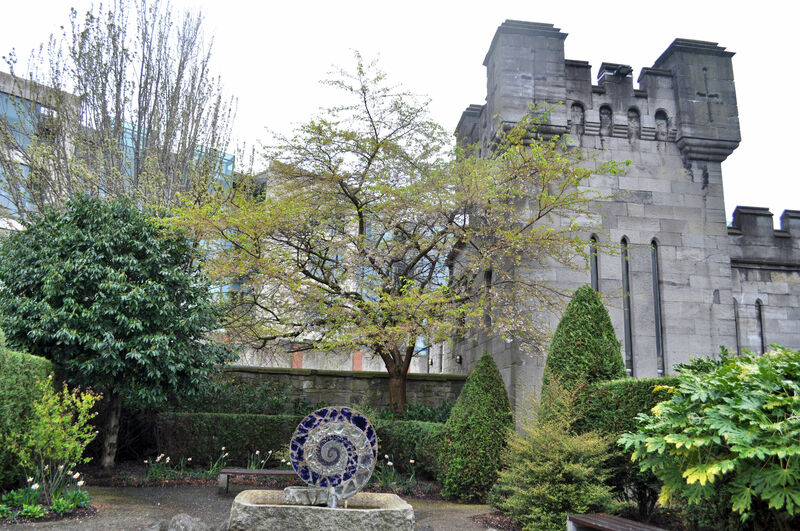 We stumbled upon Dublin Castle, and passed on the tour, but happily explored the garden nearby. 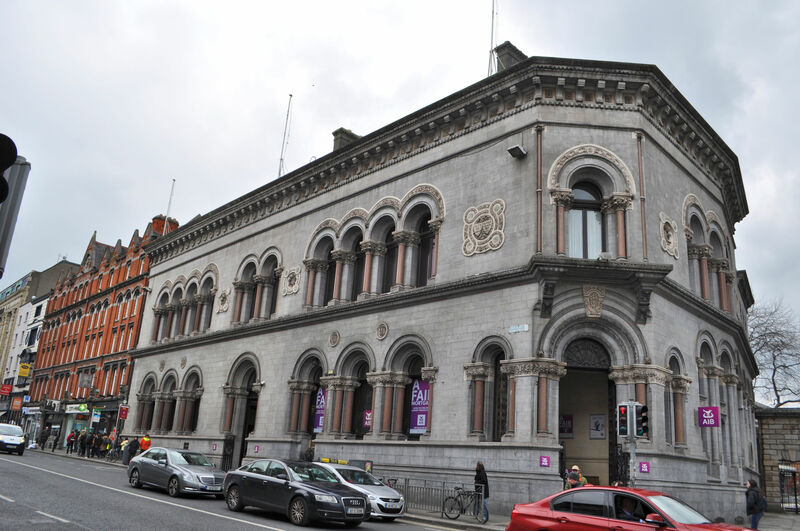 Dublin Castle tucked out of sight between city blocks. 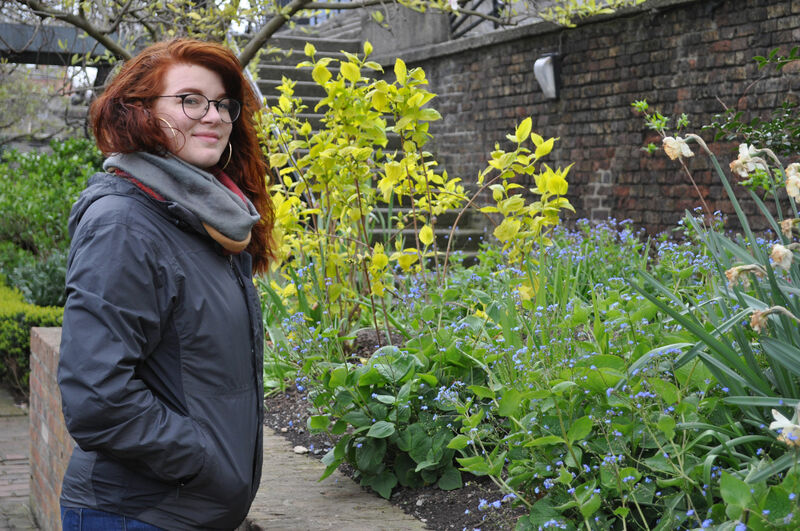 Tara in the garden behind Dublin Castle. 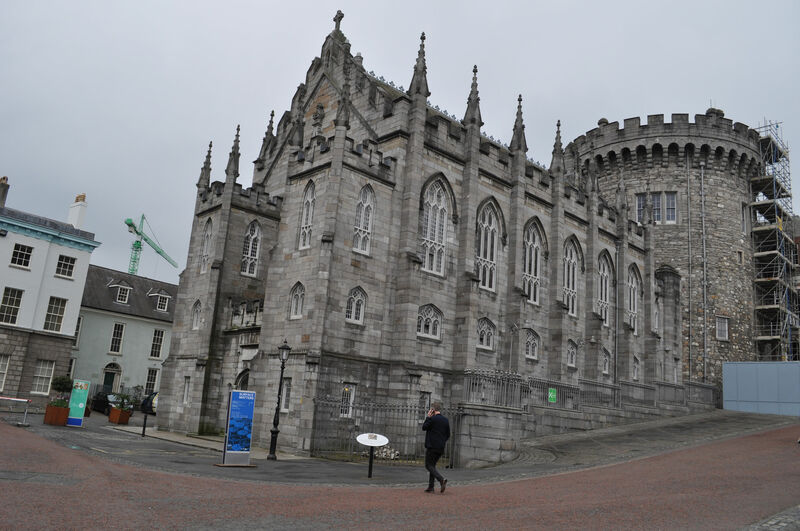 Dublin Castle from the garden. While we were in the garden it began to rain pretty hard and we got wet and even colder. The temperature had been in the low 40s all day and we had about had enough. By the time we got back to the apartment, my fingers were so frozen I couldn’t feel them, and Tara had to get the key into the lock for me. We sat there and dried out a little while, then went back to Mulligan’s for a pint. This time we got to chatting with the bartender and enjoyed ourselves so much we stayed for a second. A patron gave me a hard time for not having a Guinness, and he said if I was going to have one anywhere in Ireland, I needed to have it there. I asked why, and the bartender explained (it has a lot to do with freshness, and exceptionally clean lines). We had earlier decided we weren’t hungry enough to have a Guinness because the beer is so heavy it makes us too full. But after the explanation, Tara and I were convinced. Oh. I stand corrected. Guinness is a whole new thing if you have it from Mulligan’s. It’s a completely different drink. It’s not even beer, it’s so amazing. It’s a creamy, delicous liquid that’s in a whole separate category. It went down so easy. Yum. I can’t believe the stuff in the states can be called by the same name. We ended the night playing around on Tara Street. 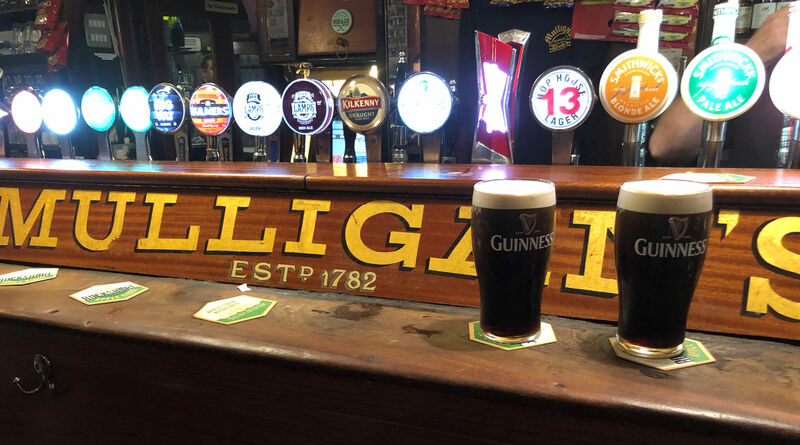 Do have a pint at Mulligan’s. 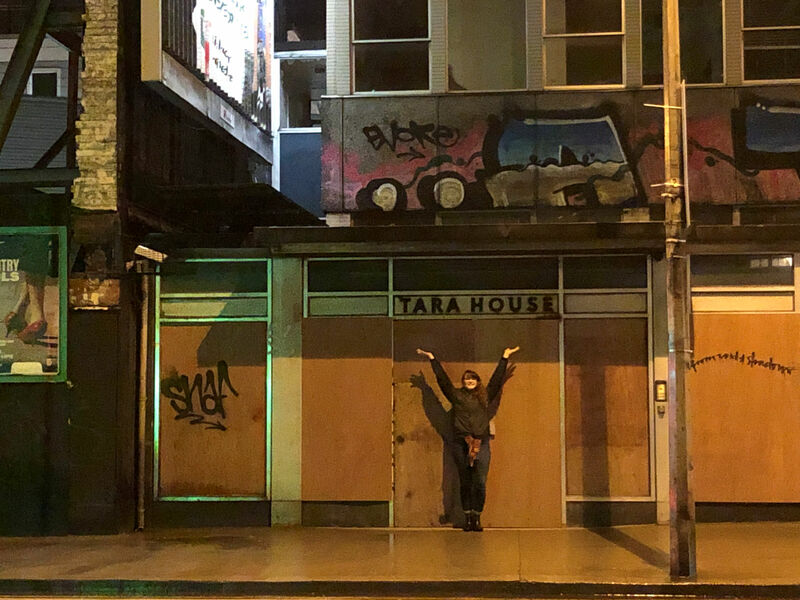 Tara at the Tara House, on Tara Street.